Enjoy Utah! : FREE Lego Classes! ﻿This morning we attended a FREE "Mommy and Me" Lego Class at the Sandy Library. It was a BLAST! It was geared towards 3-5 year olds, but they have different times for different age groups. I was really impressed with how they interacted with the kids, and snuck in some learning while using the legos. 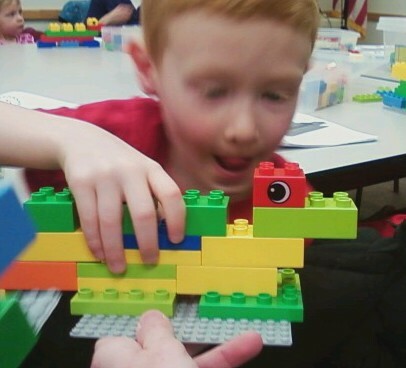 While building with Legos, the kids learned colors, math, facts about animals, and letter sounds. The letter for today was "A", and the focus was on building an alligator. They taught that if you see an alligator, you say "AAAAA!!!!!! ", and because alligator starts with "A", the "A" sound says "aaaaa"! Very clever! There are many more free lego classes this entire month, for all age groups. Check out the schedule HERE. Make sure you get registered as soon possible, because the free classes at the libraries fill up fast! Bricks 4 Kidz is the organization behind these awesome Lego classes. Their programs provide an extraordinary atmosphere for students to build unique creations, play games, and have loads of fun using LEGO® bricks. The activities are designed to trigger young children’s lively imaginations and build their self-confidence. Children work with exciting themes such as machines, outer space and mosaics. Did you know you can get a free two year subscription to Lego magazine? More details HERE.